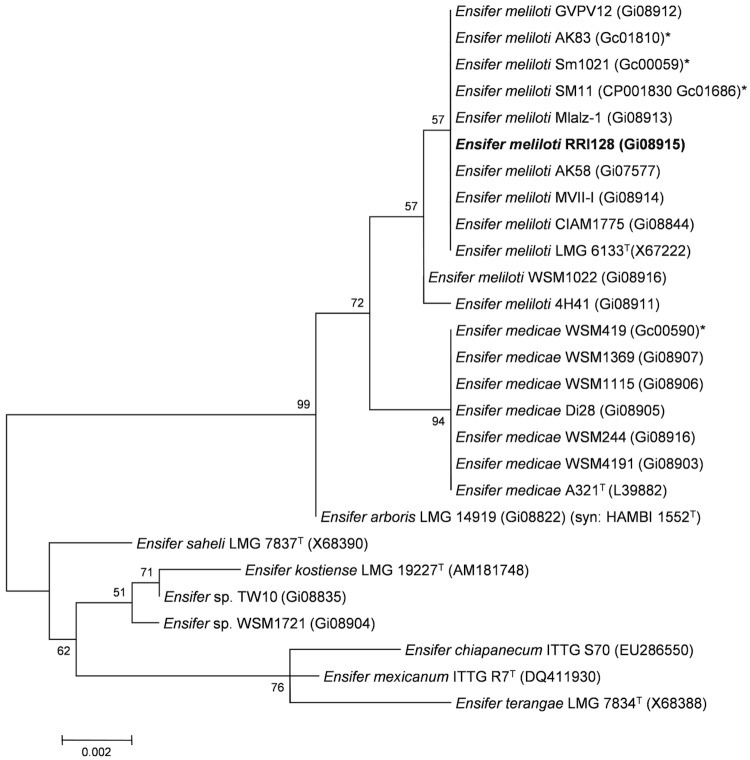 Ensifer meliloti strain RRI128 is a motile, non-sporulating, non-encapsulated, Gram-negative rod in the order Rhizobiales of the class Alphaproteobacteria. The rod-shaped form varies in size with dimensions of approximately 0.5 μm in width and 1.0-2.0 μm in length (Figure 1A). It is fast growing, forming colonies within 3-4 days when grown on TY  or half strength Lupin Agar (½LA)  at 28°C. Colonies on ½LA are opaque, slightly domed and moderately mucoid with smooth margins (Figure 1B). * 28 cultivars tested: Aquarius, Aurora, Cropper 9, Cuff 101, Eureka, Genesis, Hallmark, Hunterfield, Hunter River, Jinderra, ML 99, PL 55, PL 60, PL 69, Prime, SARDI Five, SARDI Seven, SARDI Ten, Sceptre, Sequel, Sequel-HR, Siriver, Trifecta, UQL1, Venus, WL525HQ, 54Q53 and 57Q75. All general aspects of library construction and sequencing performed at the JGI can be found at the JGI user home . All raw Illumina sequence data was passed through DUK, a filtering program developed at JGI, which removes known Illumina sequencing and library preparation artifacts (Mingkun, L., Copeland, A. and Han, J., unpublished). The following steps were then performed for assembly: (1) filtered Illumina reads were assembled using Velvet , version 1.1.04, (2) 1–3 Kb simulated paired end reads were created from Velvet contigs using wgsim , (3) Illumina reads were assembled with simulated read pairs using Allpaths–LG  (version r39750). wgsim (-e 0 -1 76 -2 76 -r 0 -R 0 -X 0,) (3) Allpaths–LG (PrepareAllpathsInputs:PHRED64=1 PLOIDY=1 FRAGCOVERAGE=125 JUMPCOVERAGE=25 LONGJUMPCOV=50, RunAllpath-sLG: THREADS=8 RUN=stdshredpairs TARGETS=standard VAPIWARNONLY=True OVERWRITE=True). Charman N, Humphries A, Smith D, Drew E, Marshall E, Denton M, Hayes R, Venkatanagappa S, Ballard R. Selection of lucerne and rhizobia for improved nodulation at low pH. 15th Australian Nitrogen Fixation Conference Margaret River, Western Australia2009. p 49. Garrity GM, Bell JA, Lilburn T. Class I. Alphaproteobacteria class. In: Garrity GM, Brenner DJ, Kreig NR, Staley JT, editors. Bergey's Manual of Systematic Bacteriology. Second ed: New York: Springer - Verlag; 2005. p 1. Kuykendall LD. Family I. Rhizobiaceae In: Garrity GM, Brenner DJ, Krieg NR, Staley JT, editors. Bergey's Manual of Systematic Bacteriology. New York: Springer - Verlag; 2005. p 324. Small E. Alfalfa and Relatives: Evolution and Classification of Medicago Ottawa, Canada: NRC Reserach Press; 2011. Howieson JH, Ballard RA, deKoning C, Sandral G, Charman N. Trigonella balansae- a new pasture legume for the alkaline soils of southern Australia. 10th Australian Agronomy Conference. Hobart, Australia. : Australian Society of Agronomy; 2001.